​The underlying theme of our research is to provide more detailed understanding and predictive capabilities of systems of interest to researchers in both medicine and alternative energy. Proteorhodopsin (PR) is a recently discovered membrane protein that acts as the light-activated proton pump, driving chemical energy synthesis in many marine bacteria. Our lab is focused on fundamental understanding of this process by simulating PR on the molecular level using molecular dynamics, as well as investigating the potential for using PR arrays in alternative energy devices for the purpose of solar-to-chemical energy conversion. You can read more about our work on PR here, here, and here. Anionic peptides have been shown to undergo spontaneous coil-to-helix transition and subsequent unidirectional insertion in an acidic cellular microenvironment, making them ideal for targeted drug delivery to cancer cells. 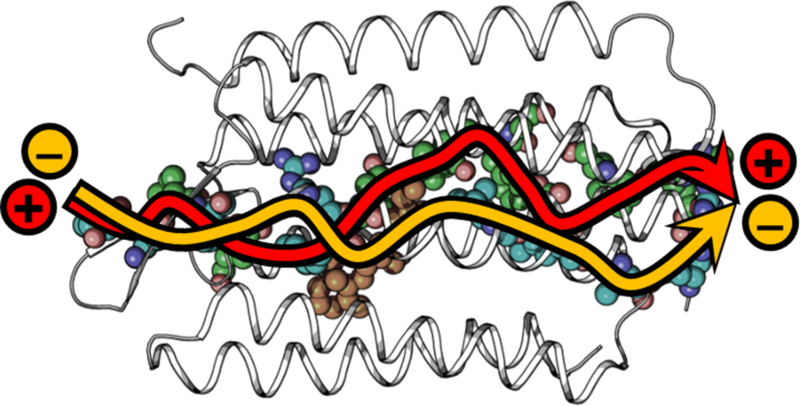 Our lab is modeling the membrane insertion process of these peptides in order to understand their structure-function relationship with respect to membrane environment. Long-term, this research will lead to the ability to improve targeted specificity of these peptides. You can read more about our work here. 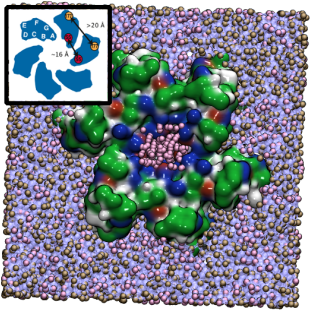 Proteins are able to conduct electricity when incorporated into a solid-state junction, but the relationship between protein structure and the pathway of electron transport remains unclear. Our lab is carrying out transport calculations to identify the pathway of electrons through peptides that are incorporated into circuits. This knowledge will lead to fundamental understanding of this phenomena and improvement of bioelectronics design. You can read more about our work here.